BACKGROUND AND PURPOSE: Neonatal alloimmune thrombocytopenia (NAIT) is a maternal-fetal platelet antigen incompatibility disorder estimated to occur in one of 2000 to 5000 neonates. The diagnosis is made serologically by showing parental platelet antigen incompatibility and the presence of maternal platelet antibodies. In the absence of formalized antenatal screening, the radiologist has an important role to play in the recognition of this disorder, which has significant implications for the index case and any subsequent offspring. Our aim was to characterize the neuroradiologic findings and identify, if possible, a consistent pattern of neurologic injury typical of NAIT. METHODS: We retrospectively reviewed the ultrasonograms, CT scans, MR images, and medical histories of six patients (21 weeks gestation to 9 years old) with intracranial injury secondary to serologically proved NAIT. RESULTS: Hemispheric porencephalic cysts (n = 6), primarily located within a temporal lobe with extension into other lobes, were seen on the ultrasonograms, CT scans, and MR images of all six children. In five cases, this was thought to represent encephaloclastic porencephaly and, in one case, schizencephaly (agenetic porencephaly). Six children had ventriculomegaly of varying degrees and severity and asymmetry. Extra-axial hemorrhages (n = 2), intraventricular hemorrhage (n = 1), acute parenchymal hemorrhage (n = 2), and neuronal migrational disorder (n = 1) occurred with varying frequency. CONCLUSION: Antenatal or early postnatal neuroradiologic imaging showing hemispheric porencephaly and lateral ventriculomegaly is a recognizable pattern of cerebral injury suggestive of the diagnosis of NAIT. In the absence of a cost-effective screening program of primiparous women and neonates for this disease, the radiologist has an important role to play in the recognition of this disease entity. It is crucial for the reporting radiologist to consider the possibility of NAIT in any child with antenatal hemorrhage and, more importantly, with the pattern of cerebral injury described above. Because a high percentage of subsequent pregnancies might be equally or more severely affected, antenatal management directed at preventing intracranial hemorrhages in utero has become of significant clinical importance. Neonatal alloimmune thrombocytopenia (NAIT), also referred to as fetomaternal alloimmune thrombocytopenia, is a maternal-fetal platelet antigen incompatibility disorder. Fetal platelets, carrying specific paternally derived antigens not present on maternal platelets, enter the maternal circulation by crossing the placenta. This causes alloimmunization and the production of platelet-specific maternal antibodies directed against these foreign antigens. Transplacental passage of these antibodies results in fetal platelet destruction with consequent thrombocytopenia and also impaired platelet function (1–6). The disease is analogous to Rhesus hemolytic disease of the neonate with one significant difference. Unlike Rhesus disease, which is rarely seen in a first pregnancy, approximately 20% to 60% of diagnosed cases of NAIT are born to primiparous women (1–7). The diagnosis is made serologically by showing parental platelet antigen incompatibility and the presence of maternal alloantibody directed against a paternal platelet antigen (2, 8). Incompatibility at the human platelet antigen (HPA)-1a locus is the most common cause of NAIT in Caucasians and accounts for approximately 75% of all recognized cases (6). NAIT is estimated to occur in one of 2000 to 5000 neonates (1–5, 7–9, 10). It accounts for approximately 9% of all cases of neonatal thrombocytopenia. It is not an uncommon cause of severe neonatal and fetal thrombocytopenia (4, 5). Fetal and neonatal platelet counts less than 20 × 109 are common even before 24 weeks’ gestation (1). The development of widespread petechiae or purpura is typically the initial presenting feature usually seen at birth or developing within a few hours of delivery (7, 10). The most catastrophic and feared complication is intracranial hemorrhage (ICH). This occurs in 10% to 30% of cases, 25% to 50% of which occur in utero (1–4, 6, 10, 11). NAIT has an estimated mortality rate of 15%, with ICH accounting for most deaths (2, 7, 12). Although NAIT has been reviewed in the hematologic and obstetric literature, comments are lacking in radiologic journals regarding the imaging findings of this disorder. We decided to review the imaging sequelae of NAIT, in recognized cases presenting at our institution, in an attempt to determine whether there is a recognizable pattern of intracranial injury that would lead the reporting radiologist to suspect NAIT as a possible cause. We retrospectively reviewed six cases of serologically proved NAIT presenting with ICH. Five children presented with subacute ICH or the sequelae of ICH in the immediate postnatal period. One child had radiologically documented ICH during the second trimester, which was followed up with antenatal and postnatal MR imaging studies. Imaging of these children included ultrasonography, CT, and MR imaging performed at the Royal Children’s Hospital, Melbourne, Australia, between June 1992 and August 2001. Each patient’s medical chart was reviewed, and the clinical data, including gestational age at delivery, mode of delivery, examination findings, laboratory results, and clinical outcome, were recorded. Details regarding maternal obstetric history, siblings, and the institution of any medical therapy (antenatal and postnatal) were also documented. Two pediatric neuroradiologists reviewed all antenatal and postnatal cranial images. The cases of six children affected by NAIT were reviewed (Tables 1 and 2). A postnatal diagnosis of NAIT was made in five of the six cases. The age at diagnosis ranged from 37 to 41 weeks’ gestation. There were two boys and three girls born to five different mothers. Mean gestational age at delivery was 38.8 weeks’ gestation. Two were born by normal spontaneous vaginal delivery, one by assisted forceps delivery, one by an elective caesarian section, and one by emergency caesarian section because of obstructed labor. Family histories were negative for hematologic and neurologic disorders, although one case of maternal autoimmune disorder was present. Each of three of the affected children had a healthy unaffected sibling. The presenting clinical abnormality in these five infants was extensive generalized petechiae and, in some cases, bruising noted at or soon after delivery and inconsistent with the trauma of delivery. Abnormal cranial enlargement and intraretinal hemorrhages were also evident in one infant. Isolated thrombocytopenia was uniformly identified in all cases by testing cord blood samples. The platelet count ranged from 12 to 28 × 109 (150–400 × 109). Serologic testing of the parents in all cases revealed platelet-specific maternal antibodies with variable parental incompatibility at HPA loci, including the HPA-1 and HPA-3 loci. These tests confirmed the diagnosis of NAIT. Two infants were treated with platelet transfusions and IV infusions of gamma-globulin with correction of their thrombocytopenia. The sixth child was identified when routine midtrimester antenatal sonography performed at 20 weeks’ gestation revealed a right cerebral hemispheric and extraaxial abnormality, later shown to be intra- and extraaxial hemorrhage on initial fetal MR images obtained at 21 weeks’ gestation. Cordocentesis revealed a low platelet count of 27 × 109. Platelet genotyping confirmed incompatibility at the HPA-1 and HPA-3 loci, but failed to identify platelet-specific antibodies. Further investigation for fetal thrombocytopenia, including serology for toxoplasmosis, other infections, rubella, cytomegalovirus infection, and herpes (called TORCH serology), failed to identify an alternate cause. The fetus was treated with maternal washed platelets administered via the umbilical vein. On the presumptive diagnosis of NAIT, maternal IV immunoglobulin was administered weekly. Repeat cordocentesis at 28 weeks revealed a persistently low fetal platelet count, confirming NAIT as the likely diagnosis. The infant was subsequently delivered by caesarian section at 33 weeks after repeat cordocentesis and platelet transfusion. The platelet count remained low during the early neonatal period before progressively rising. The infant was microcephalic at birth, and seizures were noted on day 3. The pregnancy had previously been uneventful and was the third for the 26-year-old mother. Her first pregnancy had been uncomplicated with delivery of a normal female sibling. The second pregnancy was a monochorionic twin pregnancy complicated by twin-twin transfusion and subsequent death of the donor twin. The deceased donor twin was also moderately thrombocytopenic. The second twin had had a normal platelet count and was well. Five infants had their initial imaging performed between 1 day and 4 months postnatally. Imaging modalities included ultrasonography, CT, and, in some cases, MR imaging. The sixth infant was initially identified when routine midtrimester antenatal ultrasonography performed at 20 weeks’ gestation revealed an intracranial abnormality. Subsequently, fetal MR imaging was performed at 21, 23, and 33 weeks gestation and at 5 months of age. The most common and striking radiologic finding was that of hemispheric porencephalic cysts (Figs 1–6). Porencephaly was shown in all six cases 100% and was the major abnormality in several of them. The porencephalic cysts were typically very large, replacing a substantial amount of cerebral parenchyma. Eight of the nine hemispheric cysts were located predominantly or wholly within a temporal lobe, often with extension into adjacent lobes. Three of the six children had multiple areas of porencephaly, and two of the three had bilateral hemispheric cysts. Five cysts communicated with the adjacent lateral ventricle (Figs 1, 3, and 5). In one child, fenestration surgery was performed, with resultant cyst-ventricular communication revealed by cranial MR imaging performed when the patient was 8 years of age (Fig 2C). Blood products were seen within the porencephalic cysts on ultrasonograms and CT scans (Figs 1 and 3). For the sixth child, whose condition was diagnosed antenatally, serial cranial MR imaging showed evolution of intraparenchymal hemorrhage into an area of porencephaly (Fig 5). A, Cranial sonogram obtained on day 2 of life shows a large right occipital porencephalic cyst containing echogenic clot. B and C, Axial view unenhanced cranial CT scans obtained on day 3 of life show large porencephalic cysts within the right occipital and temporal lobes. The occipital cyst communicates with the right lateral ventricle. A, Unenhanced axial view cranial CT scan shows large right frontotemporal and left temporal porencephalic cysts with enlargement and remodeling of the middle cranial fossae. B, Coronal view fluid-attenuated inversion recovery image (10002/147 [TR/TE]; inversion time, 2200 ms), obtained when the patient was 8 years old, shows large bilateral porencephalic cysts. There is absence of any surrounding high signal intensity gliosis. There is ex vacuo dilation of the right lateral ventricle. C, Coronal T2-weighted image (6200/101 [TR/TE]) shows bilateral porencephalic cysts. Communication of the right cyst with the ventricular system after fenestration surgery can be seen. A and B, Axial view unenhanced cranial CT scans, obtained on day 3 of life, show very large bilateral areas of porencephaly with marked loss of cerebral parenchyma. The cysts contain clots of varying ages and attenuation. Both cysts communicate with the ventricles. Ventricular dilatation was an equally common radiologic finding in all six cases (100%). This was of variable severity, mostly confined to one or both lateral ventricles. In two infants, only focal dilatation of the atria and occipital horns of the lateral ventricles occurred. Extraaxial hemorrhage occurred in 33% (n = 2) of the cases (Figs 4 and 5). In one child, this was bilateral and seen on ultrasonograms as hyperechogenicity and thickening of the extraaxial spaces. Cranial CT and MR imaging confirmed bilateral subdural hematomas of mixed attenuation and signal intensity characteristics compatible with acute and chronic hemorrhage. In the second infant, this was unilateral, with mass effect on the adjacent cerebral hemisphere. It was presumed to be acute, because it underwent signal intensity changes compatible with evolving hematoma on serial antenatal fetal cranial MR images. A, Sagittal view cranial sonogram, obtained on day 3 of life, shows increased bulk and echogenicity of the choroid plexus within the lateral ventricle, compatible with choroid plexus hemorrhage, as well as ventricular dilation. B, Unenhanced axial view cranial CT scan, obtained on day 4 of life, shows abnormal enlargement and variable attenuation of the extraaxial spaces, compatible with extraaxial hemorrhagic collections. Hyperattenuated blood can be seen along the tentorium cerebelli, compatible with more acute hemorrhage. A left temporal porencephalic cyst is also present. C, Coronal view gradient echo image (625/14.9), obtained on day 8 of life, shows hemosiderin deposition (very low signal intensity) within the choroid plexus of both lateral ventricles, along the tentorium cerebelli, and over the cerebellar surface. Loculated, mixed signal intensity and bilateral extraaxial collections compatible with hemorrhagic collections of varying ages can be seen. The lateral ventricles are dilated. 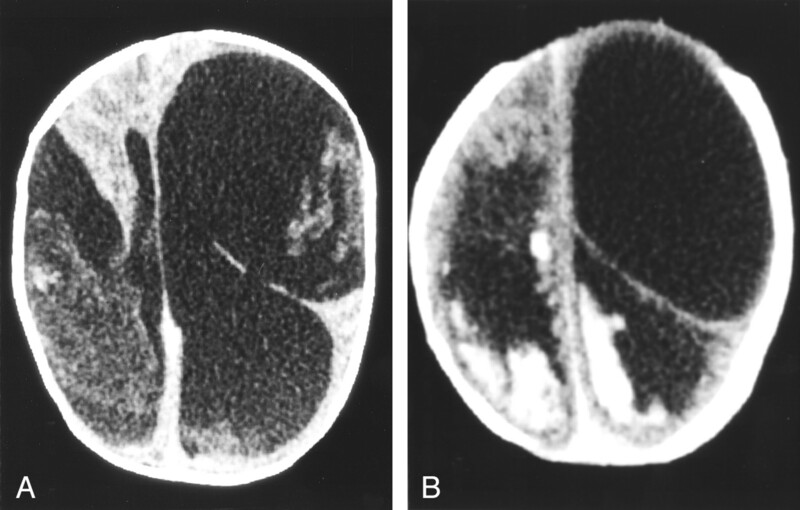 A and B, Fetal MR images obtained at 21 weeks’ gestation. Axial and coronal view T2-weighted images show a large left-sided extraaxial hemorrhage of variable signal intensity, with mass effect on the underlying cerebral hemisphere. C and D, Fetal MR images obtained at 23 weeks’ gestation. Axial and coronal view T2-weighted images (26480/100) show the mixed signal intensity extraaxial hemorrhage with more clarity. Signal intensity change within the left parietal lobe can be seen, with breech of the overlying cortex and adjacent wall of the lateral ventricle representing an area of evolving porencephaly. E and F, Fetal MR images obtained at 33 weeks’ gestation. Axial and coronal view T2-weighted images (42597/95.7) show further evolution and resolution of the left extraaxial hemorrhage. There is left temporoparietal porencephaly with ventricular communication. High signal intensity abnormality is now noted within the white matter of the right temporal lobe. G and H, Cranial MR images obtained when the patient was 5 months of age. Axial and coronal view T2-weighted images (3420/168) show left temporoparietal porencephaly with ventricular communication and loss of cerebral substance. Ventriculomegaly can be seen. Persisting signal intensity abnormality can be seen within the white matter of the right temporal and parietal lobes. 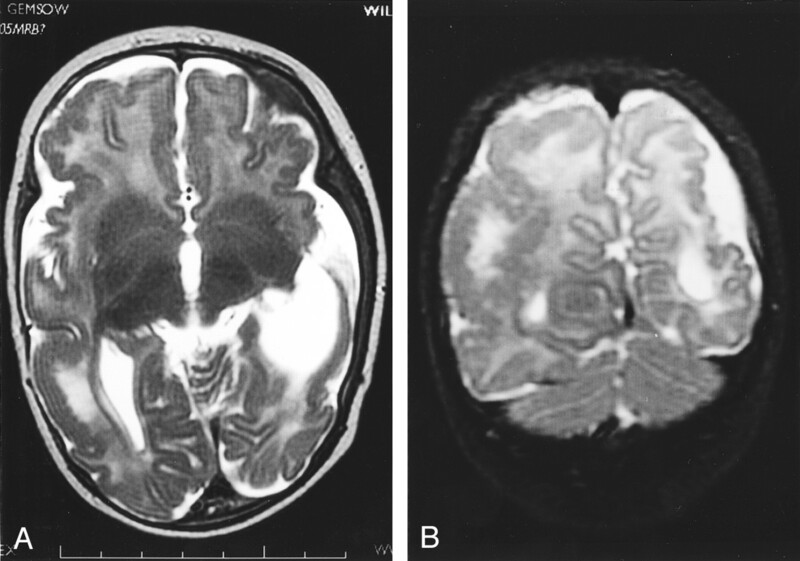 A new finding is of a neuronal migrational disorder with extensive polymicrogyria and areas of bandlike heterotopia with an almost “double cortex” appearance. Intraventricular hemorrhage occurred in 17% (n = 1) (Fig 4). This infant also had bilateral subdural hematomas. This was identified on cranial sonography on day 1 after delivery with choroid plexus hemorrhages confirmed by cranial CT and MR imaging on days 4 and 8, respectively. Associated lateral ventricular dilatation was shown. Acute parenchymal hemorrhage occurred in two infants. The antenatally detected case was shown at 20 weeks’ gestation within the right hemisphere and associated with an extraaxial collection. In the second infant, it was detected as a focal area of increased attenuation within the right frontal lobe on cranial CT scans obtained on day 3 of life. This had not been evident on a cranial ultrasonogram obtained a day earlier, at which time only the longstanding right hemispheric porencephalic cysts had been appreciated. 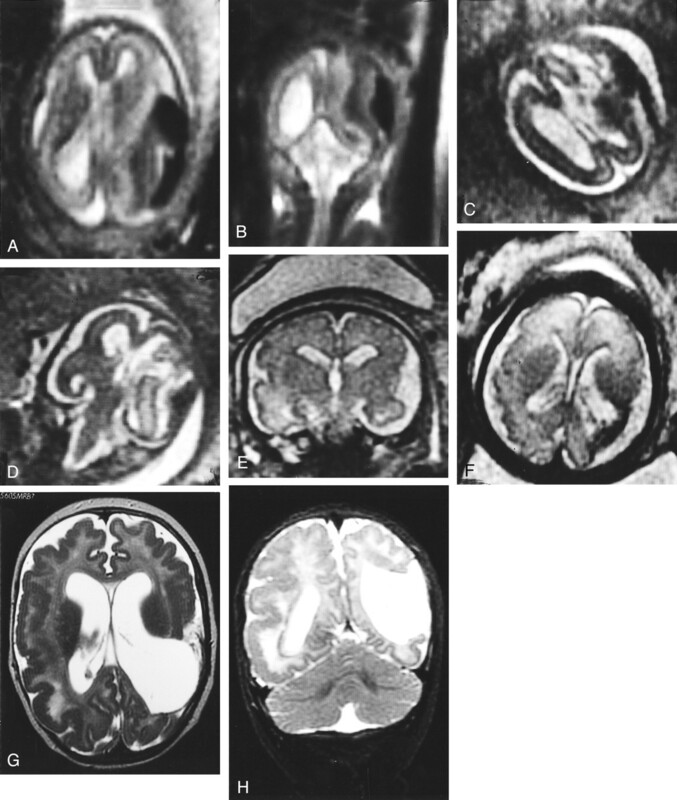 Transmantle neuronal migrational disorder (n = 1) was seen in the sixth child who had documented hemorrhage and subsequent schizencephaly (agenetic porencephaly). White matter signal intensity asymmetry was detected on fetal and postnatal MR images of the temporal lobes as early as 33 weeks’ gestation (Fig 5E–H). It was not until repeat cranial MR imaging was performed at 5 months of age that extensive polymicrogyria, affecting both cerebral hemispheres, was detected. There was associated extensive gray matter heterotopia in a band-type distribution, which approached a “double cortex” appearance (Figs 5G and H and 6). A and B, Axial and coronal view T2-weighted images (3420/168), obtained when the patient was 5 months of age, show left parietal and temporal porencephaly in association with a neuronal migrational disorder with extensive areas of polymicrogyria. Another infant had reduction in periventricular white matter associated with abnormal high signal intensity on T2-weighted and fluid-attenuated inversion recovery images, in addition to a large unilateral area of porencephaly. These areas of signal intensity abnormality were attributed to white matter ischemia and gliosis, possibly occurring at the same time as the parenchymal hemorrhage that led to the porencephaly. NAIT is a maternal-fetal platelet antigen incompatibility disorder with an estimated occurrence of one in 2000 to 5000 neonates (1–4, 6–9). It is one of many recognized causes, both maternal and fetal, of antenatal ICH (5, 13). NAIT has a variable clinical course. In most cases, the thrombocytopenia is a benign self-limited condition that resolves between 1 and 16 weeks postnatally (5, 6). The most devastating complication, however, is ICH, occurring in 10% to 30% of cases, which has been associated with permanent neurologic damage or death (1–4, 6, 10). Initially, it was thought to occur during delivery. However, there is now clear evidence that ICH occurs in utero in 25% to 50% of cases (1–5, 7, 10, 12). ICH can affect the fetus as early as the beginning of the second trimester, as was observed to occur in one of our infants, but more commonly occurs after 25 to 26 weeks’ gestation, as was observed to occur in most of our cases (4, 6). Although intraventricular bleeding can occur, hemorrhages are said to be most commonly intraparenchymal. In our study, 100% (n = 6) of the infants had intraparenchymal hemorrhages or the resultant porencephalic cysts. Thirty-three percent (n = 2) had extraaxial hemorrhages, and 17% (n = 1) had intraventricular hemorrhage. In the absence of a previously affected child and no formalized antenatal screening test for primiparous women for this disorder, the significant majority of cases are identified only after the birth of a thrombocytopenic infant (2, 3). This occurred in 83% of our cases. Affected infants are usually born to healthy mothers, with no personal or family history of bleeding disorders and after uneventful pregnancies. Because most bleeds occur after 25 weeks’ gestation, the cerebral injury will not be detected on routine antenatal morphology ultrasonograms obtained at 18 to 20 weeks’ gestation. At the time of diagnosis, usually within hours of birth, aggressive therapy including platelet transfusions and IV gamma-globulin infusions are often instituted (1, 3, 4, 6, 11). This results in normalization of platelet counts but does not reverse any neurologic damage that has already occurred in utero. There is a very high rate of recurrence of NAIT among subsequent pregnancies estimated to be between 75% and 97% (4–6, 10, 11). In general, the second affected child tends to be equally, if not more, severely affected (3, 10). The irreversibility of cerebral damage and high recurrence rates supports current trends aimed at prophylactically treating women with a fetus at risk identified by serologic testing and fetal blood sampling at 20 to 22 weeks’ gestation (6). Aggressive treatment of pregnant women with a previously affected child has been shown to reduce the incidence of ICH and any resultant debilitating neurologic sequelae (6, 11). Treatment protocols have included IV gamma-globulin, corticosteroids, elective caesarian section, and, in high risk cases, fetal platelet transfusions (3, 4, 10, 11). Poor outcomes have almost uniformly been reported for children with NAIT who sustain an intracranial bleed, with a mortality rate of approximately 15%. NAIT has been associated with the development of hydrops in utero (6). Recognized sequelae in children who survive include porencephalic cysts, hydrocephalus possibly requiring shunt surgery, cerebral palsies, seizure disorders, mental retardation, and developmental delay (7, 9). There have also been documented cases of congenital blindness and optic atrophy associated with fetal ICH secondary to NAIT (14, 15). Long-term neurodevelopmental outcome is thought to be related to the extent and location of hemorrhage with intraparenchymal bleeds associated with the poorest prognosis (1). Intraventricular hemorrhages have been associated with a less severe prognosis (16). The incidence of post- hemorrhagic hydrocephalus bears no relationship to neurologic outcome (2). Among the children in our series whose conditions were diagnosed postnatally, one child died during the neonatal period having sustained massive antenatal ICH with resultant large bilateral porencephalic cysts. Among the survivors, the neurodevelopmental outcome has been universally poor. Clinical problems have included seizures, microcephaly, developmental delay, behavioral problems, cerebral palsy, and blindness. This overall poor neurologic outcome includes the one child whose condition was diagnosed antenatally, despite aggressive antenatal management of the thrombocytopenia being instituted. At 5 months of age, she already had documented microcephaly and seizures. Although no additional new hemorrhages were documented radiologically before delivery at 33 weeks, significant neurologic damage had occurred by the time of the initial presentation. In all our infants, the predominant imaging findings were the sequelae of antenatal hemorrhage, with the most common being porencephaly. Five (85%) of the six children had encephaloclastic porencephaly, with the insult likely occurring after 26 weeks gestation. One child was thought to have schizencephaly (agenetic porencephaly) (17–19). In that case, hemorrhage and parenchymal injury was documented radiologically to have occurred before 20 weeks’ gestation and was associated with a neuronal migrational disorder. In this latter child, the evolution of intraparenchymal hemorrhage into an area of porencephaly was well shown by serial MR imaging. This has been previously documented in other children sustaining antenatal ICH as a result of NAIT (20, 21). All six children in our series had varying degrees of ventricular dilatation, most thought to be ex vacuo in nature. Intraventricular hemorrhage can cause arachnoiditis and also lead to ventriculomegaly, but only one infant in our series had an intraventricular hemorrhage. Only prospective screening of primiparous women will identify all mothers at risk and potentially eliminate the occurrence of ICH in infants affected by NAIT by early institution of appropriate therapies. To date, a screening program for NAIT has not been found to be cost-effective (22). Therefore, in its absence, the radiologist has an important role to play in the recognition of this disease entity. It is important that the reporting radiologist considers the possibility of NAIT in any infant or fetus presenting with antenatal ICH or sequelae of ICH, particularly hemispheric porencephalic cysts. Once recognized, treatment and screening can be initiated to prevent the catastrophic sequelae of NAIT in both the index case and any subsequent offspring. In our series, antenatal or early postnatal neuroradiologic imaging consistently showed large hemispheric porencephalic cysts and lateral ventriculomegaly in six children sustaining ICH as a complication of NAIT. It is crucial for the reporting radiologist to consider the possibility of NAIT for any child with radiologic evidence of antenatal hemorrhage, particularly if this pattern of cerebral injury is shown. Because a high percentage of subsequent pregnancies might be equally or more severely affected, antenatal management directed at preventing ICH in utero has now become of increasing clinical importance. In the absence of a cost-effective screening program for NAIT, the radiologist has an important role to play in the recognition of this disease entity. Once recognized, treatment and screening can be initiated to prevent the catastrophic sequelae of NAIT in both the index case and any subsequent offspring. Accepted after revision June 6, 2002.